It has been a massive seven weeks since this year’s Wakefield Show – so if you’ve turned a rather unsightly colour as a result of holding your breath waiting for the RISCOSitory show report, it’s now time to breathe normally again and let your normal colour return! 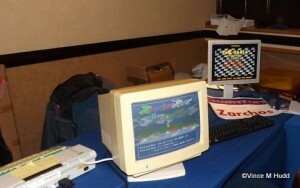 The show took place on the last Saturday in April, the 25th – the day before the 30th anniversary of the ARM processor running its first piece of code – at the Cedar Court Hotel, Wakefield, occupying the Oak/Hawthorne and Cypress Suites. The floor plan was largely arranged so that the smaller of the rooms was home mainly to the exhibitors from the retro scene, and the larger room was taken up by exhibitors concentrating on modern RISC OS, and entry into the show was via the first – just as last year, so I will repeat the approach I used for that show report and take a figure-8 route around the exhibitors, taking in those in the smaller room first, then crossing over as I move through to the main hall. I should point out that I didn’t take very many photographs, and those I did take were mainly during the busier theatre presentations – which meant the main hall was less busy, and leaving my own stand was more practical. As such, they largely make the show look rather deserted. It wasn’t – far from it; according to organiser Chris Hughes there were around 140 visitors, which is a similar number to last year. 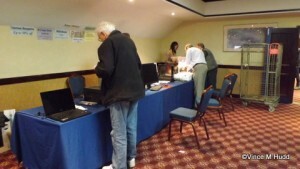 Immediately to the right after entering the show was the charity stall, on stand 1, where books, software and equipment that had been kindly donated was being sold to raise money for a good cause. I’m told that the amount raised at this year’s show was over £750 – which, as usual for the Wakefield Show, went to the Wakefield Hospice. 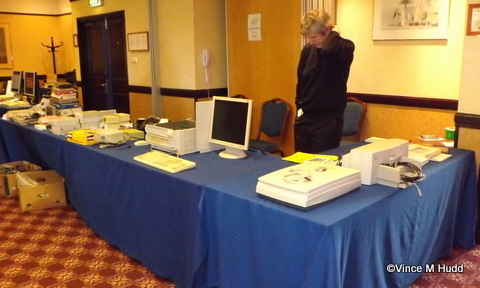 After the the charity stand was the Retro Software stand, which according to the floor plan was divided into two, with Dave Moore on stand 2 and Jason Nicholls on stand 3. There were a selection of 8-bit games available to play on both of these stands, mostly on BBC Micros, but there was also one Acorn Electron that caught my eye – it had an expansion pack attached (a Plus One, if memory serves) which was in turn connected via another expansion to another box. 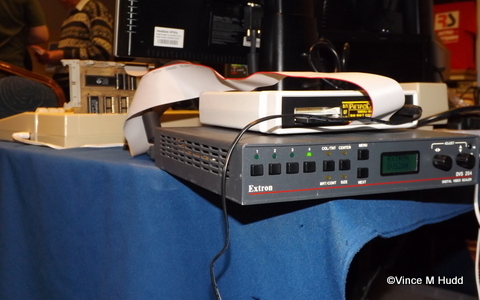 That box came from RetroClinic, and is the ‘external version’ of its Datacentre., offering 1MB of RAM, USB facilities, a 16-bit IDE interface and more. 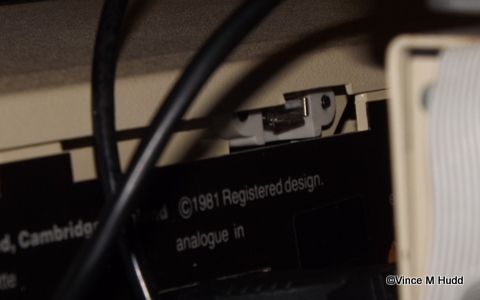 An internal version is also available, which is designed for use in BBC Micros and, further along the desk, there was a BBC featuring one – but it wouldn’t have been obvious from the front, the biggest clue only being visible from the rear where the USB socket was accessible. From the front of the computer, it looked just like any other BBC. 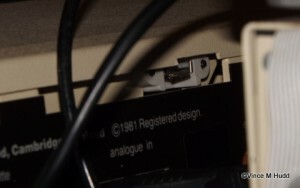 It’s therefore possible that many of the people who sat at that computer and played the game it was running remained blissfully unaware that they were using a BBC with a USB port on the rear, not to mention the other features of the Datacentre! The large corner stand, number 4, was occupied by QUANTUM featuring Zarchos – aka Steve Harrison and Xavier Tardy. 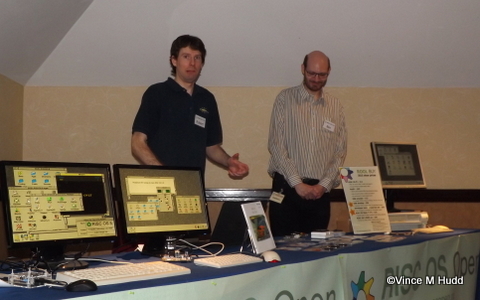 As well as a large selection of French pastries for visitors to sample (brought along by Xavier, who’d come to the show from the other side of the Channel), the main feature of the stand was Rasterman – a ‘raster bar manager’ that Steve has been developing, which greatly enhances the graphics capabilities of older Archimedes computers. 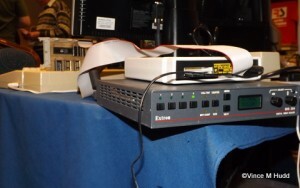 Steve gave the final theatre presentation of the day, in which he explained the facilities Rasterman offers – which include reprogramming the video controller sixteen times per scan line at either the start or the end. With 256 scan lines, that means 4,096 times per frame. One of the ways the video controller can be reprogrammed is to redefine the pallet. The Archimedes had an available pallet of 4,096 colours, with the actual number allowed on screen being dependant on the screen mode in use – for example, mode 12 allowed up to 16 colours, and mode 15 up to 256. Rasterman therefore makes it possible to use the full pallet in any screen mode. 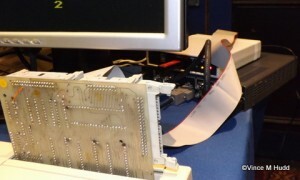 Other facilities offered include changing the screen memory address – with one of the demos on the stand showing that being done using a sine wave, causing a neat ‘wobbling’ effect. Steve has also rewritten QTM so that it works in tandem with Rasterman – because the latter disables interrupts to do what it needs to do, and QTM uses interrupts to play background music; with games and demos being where Rasterman would be most useful, having a means to play music was quite important. 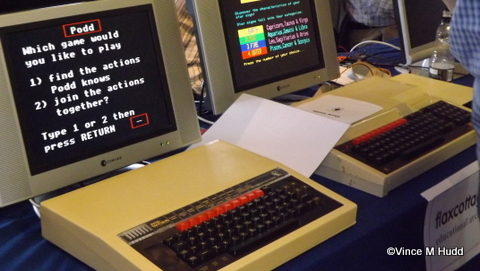 He has also written a keyboard handler so that game controls can still work. 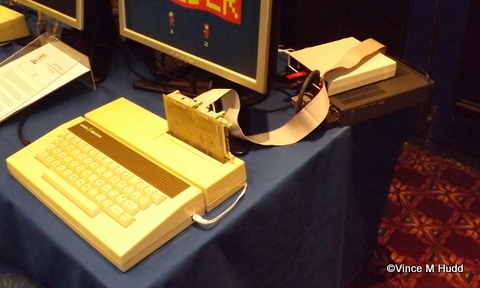 After QUANTUM came Retro Hardware on stand 5. Dave Hitchins had a number of add-ons and expansions for the Acorn Electron – such as an Advanced Tube Interface, an Advanced ROM Adapter, and an Advanced Battery-backed RAM pack, which are all developments of products once supplied by P.R.E.S., and available in either kit or pre-built form. Educational software for the BBC was once a big thing – and the Flax Cottage Educational Archive – represented on stand 6 – is a collection of titles in this field, along with the documentation. Some of these titles were running on the stand over a small Econet network, just as would have been found in schools some 30 years ago (but not at my school, where we only had a single Beeb!) – and there was also a Raspberry Pi running some of the archived software natively on RISC OS Pico. 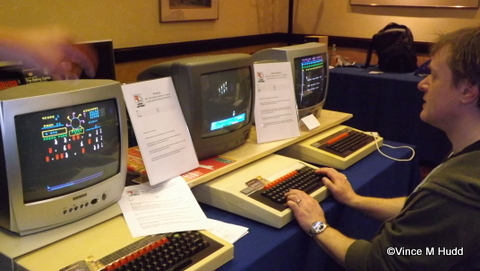 The Acorn and BBC User Group – ABUG – had stand 7, where visitors would have been able to compete to achieve the highest scores of the day in three classic BBC games. 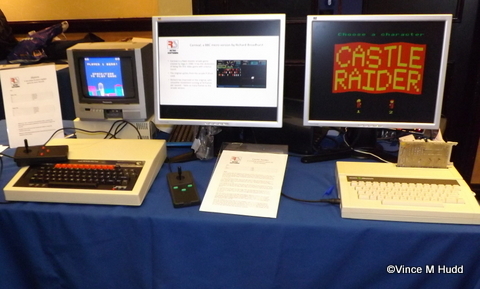 Both machines on the stand – a BBC Model B and a Master 128 – were equipped with MMC cards containing the ‘Stairway to Hell Collection‘ featuring most games released for the BBC. 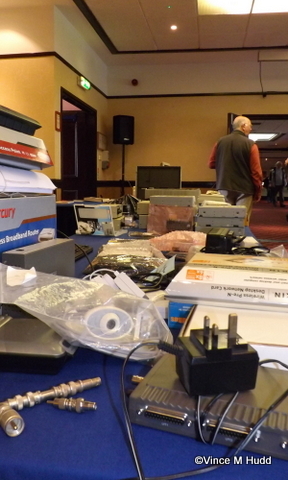 The group arranges meetings (so far only in the North of England) where retro enthusiasts can get together and show off their latest software and hardware developments. 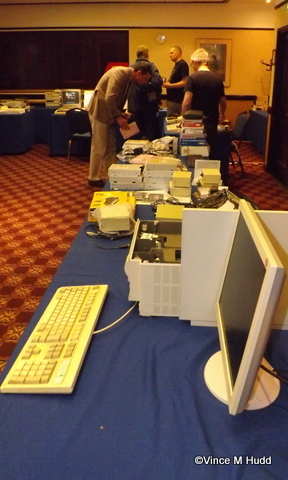 Moving into the main hall, stand 20 belonged to the Wakefield RISC OS Computer Club – the show’s organisers. 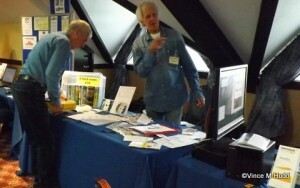 The group is proudly telling people that they are now international, with members from beyond mainland UK’s shores, and were selling the latest edition of the newsletter CD (containing all the newsletters the group have published since its early days), along with club memberships, networking guides, and sampler DVDs featuring video recordings of the last twelve months worth of meetings. 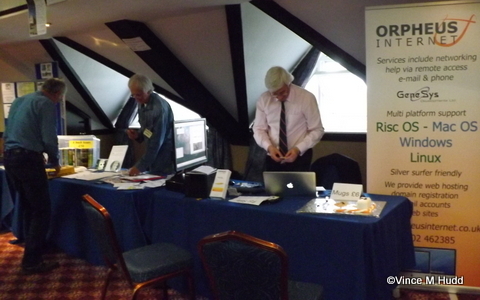 The company behind the – no THE – personal information manager for RISC OS, Organizer, were next on stand 19. Version 2.23 of the software was launched at the show, which features a new layout for Diary entries, and a simplified view of the Diary in the Planner pages which, say the developers, allows you to better plan ahead with the software. Diary entries are shown in the same order, and with the same styling, as the rest of the diary, but certain ‘nitty gritty’ information isn’t shown in this simplified view, which means users get a clearer view of their main commitments. In other words, if (say) I had an appointment with the optician on Wednesday, this simplified view tells me just that – and not the specific details; I’d need to click through to see those. As usual, North One were selling the latest version of Organizer on a Stick, which provides Organizer and RPCEmu on a memory stick for running on a PC, and features the latest versions of all the key elements: Version 8.11 of the emulator, version 5.20 of RISC OS and, of course, version 2.23 of Organizer. First launched at the 2014 Wakefield Show, a new version of RiscOSM was available from Sine Nomine on stand 18. 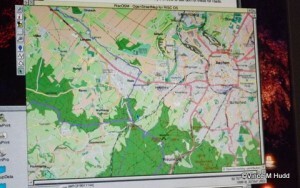 The latest version includes postal codes for the Netherlands, and support for the national grid systems for both the Netherlands and Ireland, the ability to copy and paste and drag and drop in the new map window, the ability for multiple maps to be loaded and rendered together where mutual borders are visible, and much more. Sine Nomine’s Matthew Phillips provided the penultimate theatre presentation of the day, in which he talked about the OpenStreetMap project, including examples of how things are added or updated on the site, and from that he ran into RiscOSM itself, and how the data from OpenStreetMap is converted for use in the software, before going on to give a detailed demonstration of some of its facilities – including the ability to predict the future, and show which parts of the country will be under water when the sea levels rise. As well as RiscOSM, Sine Nomine also had relational database Impact and games such as House of Cards available. 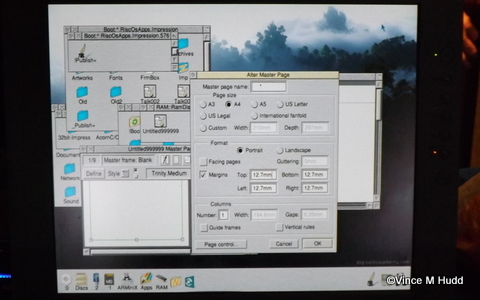 Richard Keefe had stand 17, where he was showing off the latest version of Impression-X – the ongoing 32-bit conversion of desktop publishing software Impression. It remains an ongoing conversion because a full conversion is (unsurprisingly) still a very long way off – Computer Concepts wrote a lot of the software in a customised form of ARM assembler, so it isn’t a simple case of recompiling; Richard has to carefully work through the code, bit by bit, file by file, module by module, looking for anything that will not work on modern ARM processors, and deal with what he finds – while at the same time, ensuring what he changes remains fully compatible with other parts of the software and basically continues to work. The number of files involved is high – Impression is a very comprehensive piece of software – making this a vast undertaking. Richard doesn’t yet have a website set up for the software – though he has registered a domain and says a website will be coming soon. Meanwhile, in order to make the latest version available to a wider audience than just those who attend shows, the developer provided a CD to R-Comp’s Andrew Rawnsley so that Impression-X could be made available via !Store, which it now is. In the months leading up to the show, readers of the RISC OS Open forums will have seen much discussion of a new game in development. That game was Overlord, and was available to try out and purchase at the event – developer Anthony Vaughan Bartram of Amcog Games had stand number 16. The game is a tube shooter, which means that (in effect) the model on which game play is based puts the player at the top end of a virtual tube, looking and firing down into it, as the enemy ships and other objects come out from within. Since the player is located at the top end, that means the player’s lateral movement takes the ship around the top edge of the tube. It’s a difficult model to use if you aren’t accustomed to it – the controls take you clockwise or anti-clockwise around the top edge, so depending where you are, what you might normally consider “left” or “right” could be left, right, up or down – and I’m not used to it, having not played anything like that since I was a teenager (from when an arcade game called Tempest springs to mind). Well, that’s my excuse for not doing particularly well when I had a go on the day, anyway. 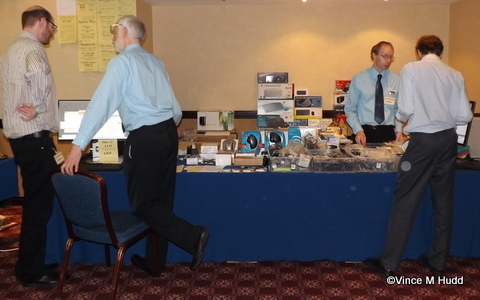 Stand 15 was next, where the Doctor and his travelling companion, Chris Evans and Andrew Conroy of CJE Micro’s, could be found with their usual wide selection of goodies. The headline feature for the company at this year’s show was their currently unnamed IGEPv5-based computer, for which there is a competition to change that unnamed status. My suggestion, since it is currently the machine with no name, is the Eastwood, which would naturally bring with it a enormous potential for other jokes, given the number of films Clint Eastwood has made – for example, since there are three case designs, they could be referred to as The Good, the Bad and the Ugly, and if there are any upgrade options, these could be added at the time of purchase For a Dew Dollars Quid More. Chris covered the computer during his presentation in the show theatre, explaining that the processor is a Cortex A15 (OMAP5432) “next generation” CPU. He was unable to say what speed the computer will run at because, it seems, the documentation is contradictory – at one point they suggest “up to 2GHz” while elsewhere a speed of 1700MHz is mentioned, and elsewhere again the speed is given as 1500MHz – so they are anticipating the latter, but there may be a possibility of it being faster. 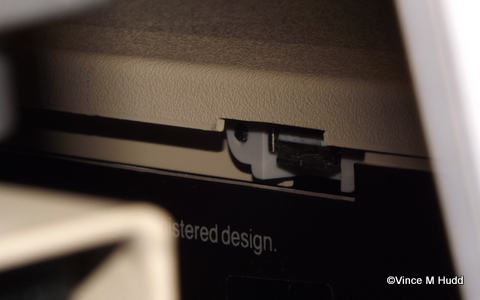 There are still issues to be addressed in the port of RISC OS to the hardware, such as USB which currently seems to “go into limbo” for about fifteen seconds during boot, before returning to life and allowing things to proceed normally – but overall, things are moving forward. The price of the base system is expected to be £725, with additional options available for a few dollars quid more (see what I mean? it works! Note also the picture caption for more evidence!) and the company is running an ‘early adopter’ scheme for those who want to get their hands on the hardware now. Early adopters will get the machine in its current state of development, which most notably lacks a SATA driver, for £100 less than the final price. At a later date they will be able to add the SATA driver, by paying the final £100 and putting the computer at its full price. For a few years now, RISC OS Open Ltd have occupied the stand in the far corner, numbered 13 on this year’s floor plan. However, this year they occupied both that and the one before it, number 14 – where they had a robotic arm laid out for punters to attempt to build, just as they’d done on an extra table at the earlier Southwest Show. I’m not sure if any progress was made with that! Ben Avison and Rob Sprowson were looking after the main stand, where they were selling a range of software, books and other merchandise, and Rob gave the company’s theatre presentation. 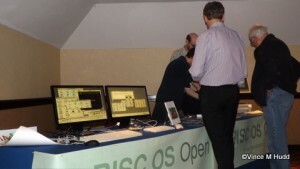 He began with a run down of RISC OS Open’s year since the 2014 Wakefield Show, starting with May 2014 when a glass was raised to BASIC, which had reached 50 years old, and Pico was released in celebration of that. There was a new set of DDE (Desktop Development Environment) manuals, weighing in at some 1.8KG, which according to Rob can be put to a number of uses, including propping up a wobbly table. Developers can also use them as a source of up to date information on the DDE, though, which is quite handy. The final straight began with Christopher Dewhurst representing on-off-on-off-under-new-management PDF magazine Drag ‘n Drop on stand 12. 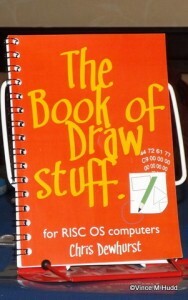 As well as the latest issue (6i3) of Drag ‘n Drop, and a memory stick containing all the issues of the magazine published to date, Chris also had a new spiral bound, 146 page dead tree publication on sale – The Book of Draw Stuff – which covers a wide range of areas, from creating grids to generating complex diagrams with BBC BASIC. The book features a number of type-in listings to do such things as produce tables from CSV files, plot text onto curved paths, and more. I was on stand 11, representing Soft Rock Software, where I once again – and this is becoming something of a habit – had something to sell. I had with me the remaining stock of the first batch of RiscPiC-mini cases, designed to house the Models A, B, B+ and version 2 boards but, unfortunately, sporting a design fault making them suitable as supplied only for the original A and B. I also took a number of these home – so there are still some remaining for future shows! In addition to something to buy, visitors also had something to play – as is now customary, a laptop was set up running VirtualRiscPC on which Soft Rock Software’s old budget games were available to play. 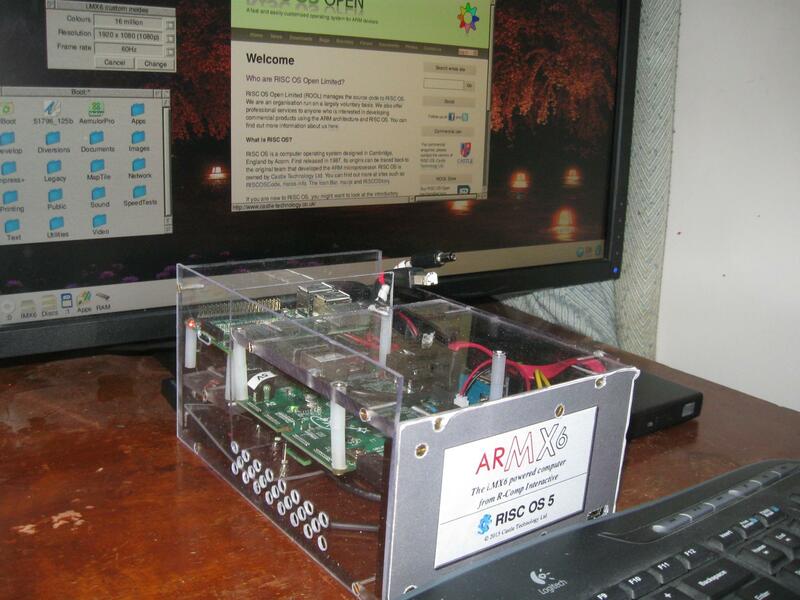 And, of course, WebChange was being discussed and demonstrated on a Raspberry Pi. 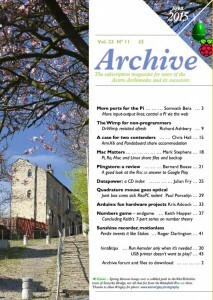 Archive magazine was next, on stand 10, where editor Jim Nagel had brought along the latest edition – volume 23, issue 11. 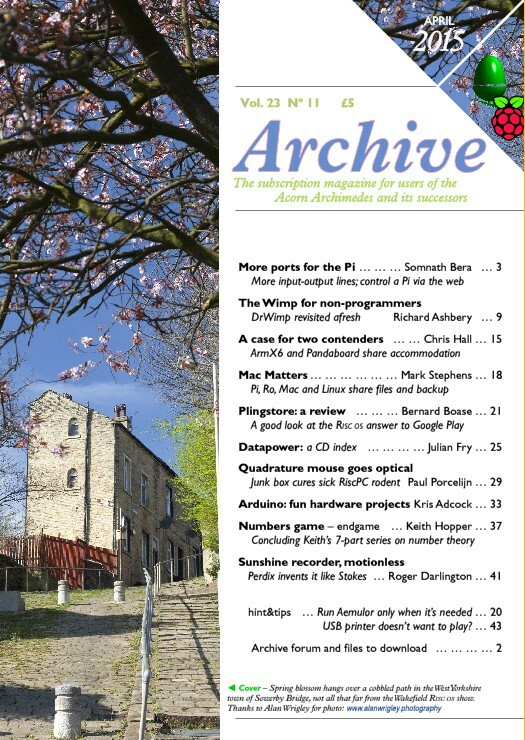 That’s the second issue in as many months, which is pleasing to say the least! Former editor Paul Beverley often attends the Wakefield Show and helps man the Archive stand – but this year he was otherwise occupied with a charity cycle ride from John o’Groats to Norwich (home) – which was completed on 5th May, and has resulted in over £4,000 being raised to date for the British Heart Foundation. Back to the show, however, and Jim was also selling optical media containing all of the issues of the magazine published so far – a handy format, I’ve found, and something that takes up a great deal less physical storage space than hundreds of copies of the magazine. The most RISC OS friendly ISP was represented by the most RISC OS friendly ISP boss, next, in the form of Richard Brown of Orpheus Internet on stand 9. This year is a double birthday celebration for Richard, because Orpheus Internet – originally set up by the late Paul Vigay – was celebrating its 10th birthday, and GeneSys Developments, its 15th year. 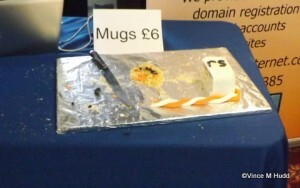 As such, there was cake to be had again, and anniversary mugs for sale. And, of course, you could have discussed your connectivity requirements with Richard, as well. Finally, R-Comp were on stand 8, where Andrew and the team had, as ever, a range of their software and hardware for sale, including the ARMSX ARMX6 computer, RISCBook Essentials, various items of software, and a new product in the form of PiFi. R-Comp’s Andrew Rawnsley gave the first theatre presentation of the day, where he covered a number of these. The PiFi, he explained, “was born out of our desire to do something interesting with a Raspberry Pi” – and an interesting use it is indeed. 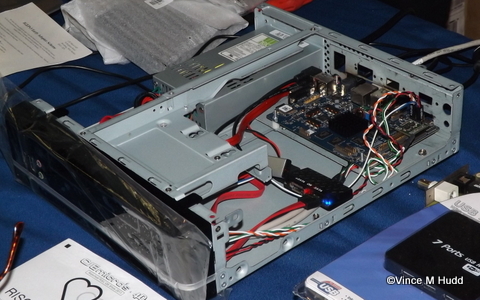 A Fedora Linux build is run on the Pi, which includes support for USB WiFi dongles, and presents a NetSurf-friendly web-based configuration to whatever is connected to the Pi over ethernet. 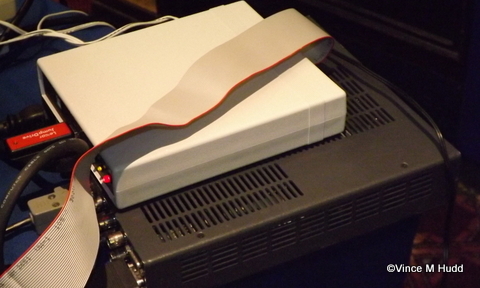 As such, the Pi can be used to provide WiFi connectivity to RISC OS computers (directly, or indirectly via a hub). The difference between doing this and using, say, an ethernet WiFi adapter is that the latter tend to need configuring by a system with a more capable web browser – which might be fine when you’re sat at home, but not so fine if you want to use your RISC OS equipment somewhere else, such as in a pub. PiFi therefore turns a spare Raspberry Pi into a WiFi adapter-adapter for RISC OS computers. 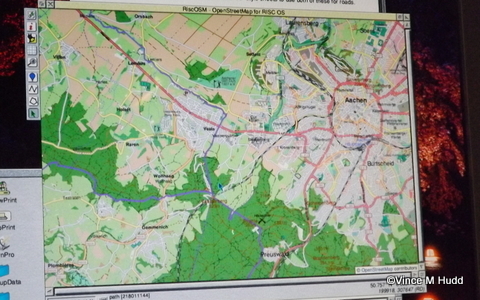 The main focus of the talk was, of course, the ARMX6, and Andrew gave a brief overview of the computer’s history, going right back to the idea’s inception – which in terms of the i.MX6-based ARMX6 we have now, was ostensibly September 2013, when R-Comp were looking at a way to move forward from the Pandaboard-based ARMiniX. Interestingly, however, that wasn’t the first time they’d considered an i.MX processor; before launching the ARMiniX, they had been considering the i.MX5, but in the end decided that the Pandaboard made for a smoother transition from ARMini to the ARMiniX. Other topics covered in less detail in the talk were the new RISCBook Essential range of computers, laptops running Windows, which in turn run RISC OS via VirtualRiscPC, and the !Store Collection CD – a selection of ‘digitial only’ releases (i.e. which have only been released via !Store, and not on CD) from the last twelve months, including DeleGate, Photofix, Deskedit, Chartwell, and more. See you next year – or possibly sooner!